In the special battle of Marathon anniversary issue of Ancient Warfare magazine I published an article title The Storm of Spears and Press of Shields, wherein I presented a distillation of all of my views on hoplite combat. I will post some of that article here in the next few posts and supplement it with other information. "Over the last half century, a schism developed over hoplite combat that has devolved into a bellum sacrum, with an orthodoxy assailed by an increasingly popular heresy. The orthodox position, championed by Hanson, Luginbill, and Schwartz, portrays hoplites as lumbering masses of men that charged directly into each other and contested the battlefield by attempting to physically push their foes. 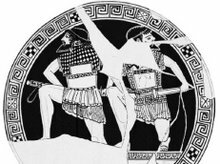 Van Wees, Krentz, and Goldsworthy, describe hoplites as closer to skirmishers, fighting in an opened order, and often paired with missile troops. Any “push” was either a figurative description or uncoordinated shield-bashing. I believe they are both in some measure correct, and often equally wrong, because this debate has forced historians to stray far from their fields of study. Their arguments suffer from an insufficient understanding of the physics and mechanics of large masses or crowds. Group behavior is my field, and, with the context that I can provide for their arguments, I shall make an attempt at syncretism." That is how the article opened, and I think both sides in the debate will find explanations for things they hold true and the other side denies. I hope in the end, after reading this, you will see that there really is not such a divide between the opinions of both camps once we cast off what is not physically likely.